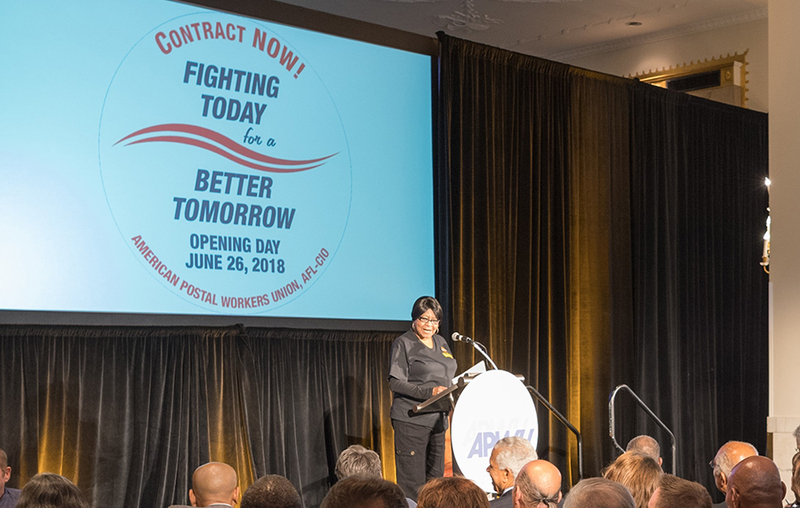 Members of the American Postal Workers Union got fired up for the opening of collective bargaining with a raucous rally on the evening before negotiations began, promising intense member engagement across the country.It wasn’t just a packed room of APWU leaders and supporters who participated. In fact, the rally was streamed liveonline to thousands on both the APWU website and on YouTube, and many members viewed it at “watch parties” organized for the event. APWU President and lead negotiator Mark Dimondstein said a threat by the White House to privatize the U.S. Postal Service as part of a wholesale reorganization and downsizing of the federal government has served to raise the stakes not only for postal workers, but for everyone. “Now we’re also bargaining for the American people, to preserve regular mail and package services at an affordable cost to 157 million addresses every day,” he said. APWU Secretary-Treasurer Liz Powell introduced a series of fiery speakers – from Tefere Gebre, Executive Vice President of the AFL-CIO, to Elise Bryant, President of the Coalition of Labor Union Women, who led the delegation in songs and chants. 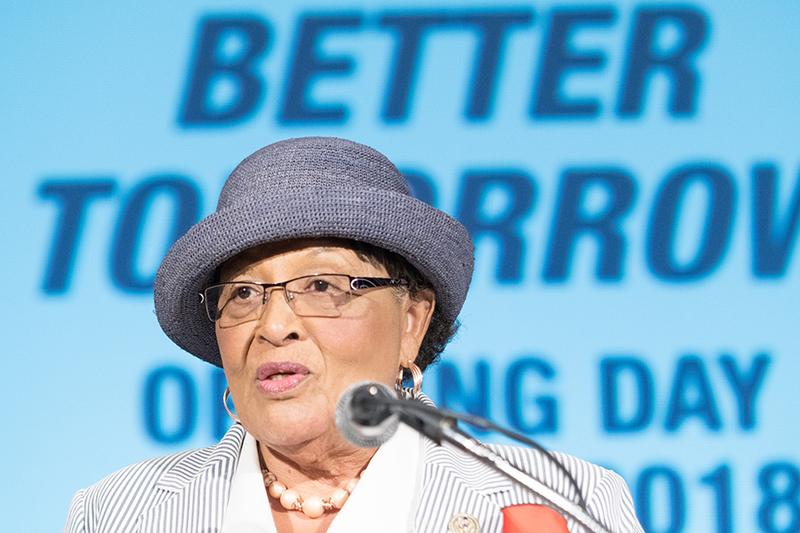 Rep. Alma Adams (D-N.C.) vowed to fight postal service privatization, as did Sen. Bernie Sanders (I-Vt.) in a letter read to the gathering. The room cheered when Vance Zimmerman, APWU’s Industrial Relations Director and chief spokesman for the bargaining team, gave opening remarks before sharing a video featuring APWU members who spoke of their pride in their work, their union, and their common belief that obtaining a good contract now is important for all members and their families. The video was a compilation of video clips, shot on cell phones, and submitted by members from coast-to-coast and from all crafts. 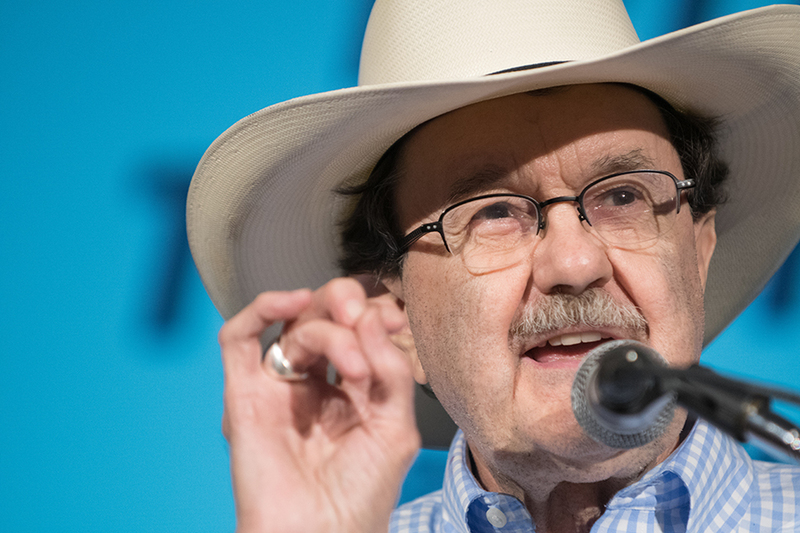 With the rally livestreamed, postal workers and allies across the country could also watch as Texas prairie populist Jim Hightower delivered his pokes at privatizers with a serious appeal to organize the people to fight postal privatization. United Mine Workers Secretary-Treasurer Levi Allen thundered the words of Mother Jones, “I’m not a humanitarian. I’m a hell-raiser,” drawing whoops and hollers from the crowd. The solidarity was heartening. Officers of the National Association of Letter Carriers and the National Postal Mail Handlers Union said they would joinAPWU at the bargaining opener, and pledges of support were delivered in person by leaders of other unions and coalitions, including the NAACP, Jobs with Justice and the A. Philip Randolph Institute. Larry Cohen, former president of the Communications Workers of America, promised to mobilize his new group, Our Revolution, building on the issues of the Bernie Sanders political campaign. The crowd gets fired up and ready to go! Longtime friends of APWU, Arlene Holt-Baker, the former Executive Vice President of the AFL-CIO, and Bill Lucy, former Secretary-Treasurer of AFSCME and founder of the Coalition of Black Trade Unionists (CBTU), joined in to add their support. And current CBTU President Terry Melvin, also Secretary-Treasurer of the New York State AFL-CIO and an ordained minister, gave an inspirational speech that had everyone on their feet, ready to fight for a good contract.